Rapicut has developed Tungsten Carbide Buttons in various grades suitable for use in products like Down The Hole Drilling Bits, Tricon Rock Roller Bits, Special bits required for underground cable laying, etc. Tirupathi Enterprises is a well known company for both research and production of different types of Tungsten Carbide buttons. These buttons are widely and effectively used in manufacturing of drilling machines for heavy rocks and also for crashing of stone and aluminum oxide. Shield Alloys India Pvt. Ltd.
Rapicut can supply the buttons in ground and tumbled finish which facilitates perfect fitting in shank. Heavystone Laboratory LLC through development and marketing of high-end engineering tools that are made of the functionally graded cemented tungsten carbide (FG WC-Co) and other advanced hard and superhard materials. our buttons are the best of its field. Will give the naximum performance in the segment of water well drilling and mining sectors. 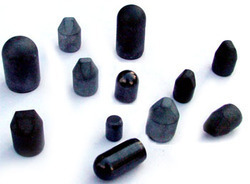 R. S Traders (india) is a well known company for both research and production of different types of Tungsten Carbide buttons. These buttons are widely and effectively used in manufacturing of drilling machines for heavy rocks and also for crashing of stone and aluminum oxide.